Looking back at some of my previous Quiznos reviews, I discovered something odd. While I’d often extolled the virtues of Quiznos’ various options for sandwiches under $5, I had mainly focused on reviewing the limited time special sandwiches, which generally are more expensive. In an effort to correct this, I recently had two bullets, the $3 price-point sandwiches (larger torpedoes come in at $4, while small flatbread “sammies” are only $2). Here’s my thoughts! Both the Turkey Pesto (which I’d had before) and the Beef, Bacon & Cheddar were quite good. The Pesto Turkey was topped with mozzarella cheese, lettuce, tomatoes, and the titular pesto spread. It had a vaguely Italian flavor without being spicy, which was nice. I sometimes think about going back and retrying particularly good or bad sandwiches, let me know if you guys would be interested in reading that. The Beef, Bacon & Cheddar was more plain in comparison, since I only added tomatoes to the named ingredients. However, when you’re combining bacon and cheddar cheese, it’s hard to go wrong. Both sandwiches were very tasty, but even together they weren’t quite filling. The bullets definitely work better as snacks than as a meal, since the two of them together cost $6 and were less filling than a Subway footlong. However, I still maintain that Quiznos subs are much better in terms of vision of how their sandwiches should taste compared to Subway, and these cheap sandwiches are a great opportunity to see that firsthand. I’ve always thought that there’s a weird divide between quick options like Quiznos and more upscale $12 sandwiches at places like Dean & Deluca. At what point does a sandwich have gourmet distinction? Each bullet had the same amount of meat as a small sandwich. If you bought them together you always got the “Choose Two” price of $5.50. Although, the bullets and torpedoes were pulled from the menu. Quiznos now offers Grilled Flatbreads and two little slider sandwiches (each with the same amount of meat as a small sandwich). They are delicious! Get the flatbread and two sliders for only $5.99 plus tax. All this contains the same amount of meat as three smalls. Meat specs have also been raised beginning April/May 2012, whenever the new menu has been installed. Quality ingredients, means higher prices. You get what you pay for is exactly right. Quiznos has real all-natural all white turkey breast and chicken, real prime rib and black angus. We also only have real all-natural cheeses, Mozzarella, swiss, and mild cheddar, none of that over processed American cheese (no offense). 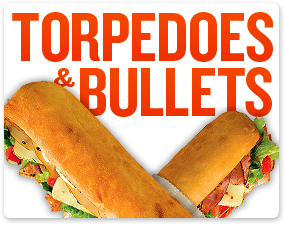 Quiznos also has a strict TWO-DAY throw time on all sliced meat, cheese and veggies. The health department says SEVEN. I wonder what Subway says, or any other restaurants…..